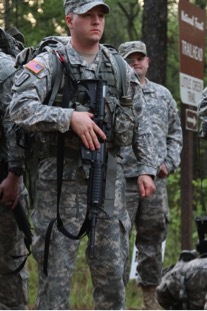 The competition included the Army Physical Fitness Test, various Army Warrior Tasks, day and night land navigation courses,12-mile ruck march, weapons qualification, an obstacle course and a surprise “mystery event” that featured physical exertion and tactical execution. 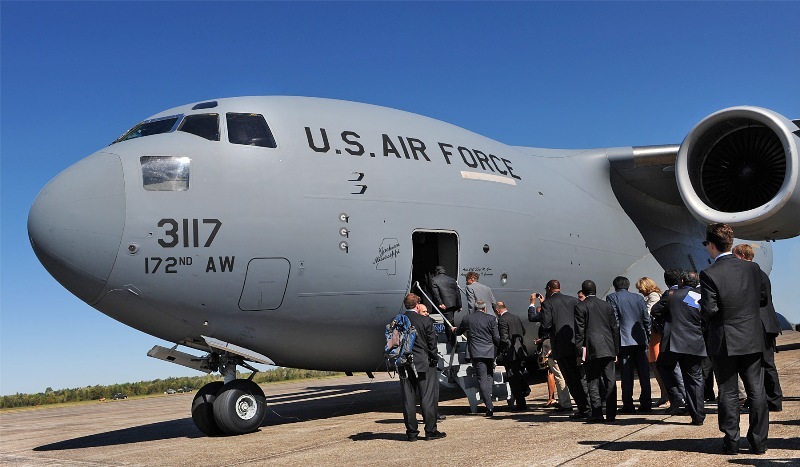 The Soldiers arrived at Camp Beauregard from locations around the state the afternoon of April 6 to in-process, review their AWTs and get a good night’s rest before the grueling competition began. 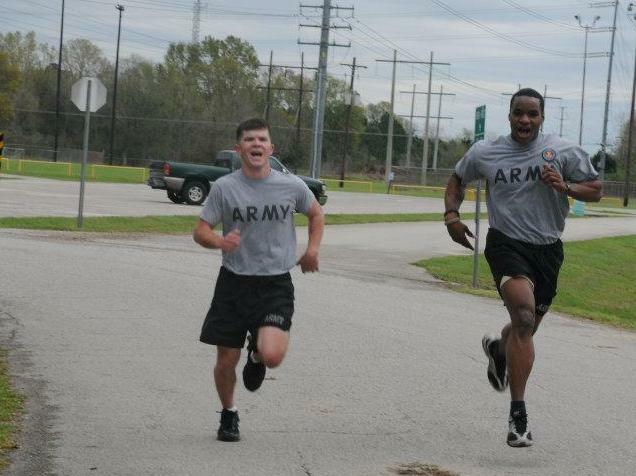 The competition began with the APFT and Soldiers attempting to max the number of push-ups and sit-ups in two-minute time frames and concluded with a three-mile run, one mile longer than the typical Army APFT. After completing the APFT, soldiers changed into their duty uniforms and were shuttled to Camp Livingston in Ball, to begin land navigation. Camp Cook is known to be a particularly tough course due to the dense underbrush in the hilly pine forests. During day land navigation, Soldiers had to plot and locate four specific points using only a compass, protractor, map and their own wits. 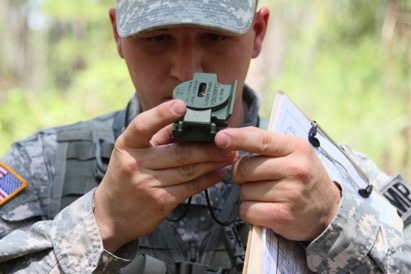 The night course requires the same skills and allows the use of a red-lens flashlight for map reading only. Guillory also said that due to recent logging and past control burns, there were many hidden obstacles that could’ve seriously injured the competitors if they weren’t mindful of the holes, ditches and stumps. At roughly 10 p.m., the Soldiers, cut and bruised, were shuttled back to their barracks to prepare for the next day’s events and get a few hours of sleep. Wake up was at 4:30 the next morning and had the Guardsmen preparing for the next event, the 12-mile ruck march which required them to carry a 35-pound rucksack and rifle in less than three hours. For the hardiest, the march turned into a run. 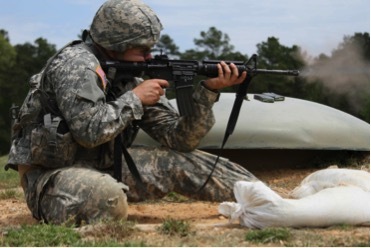 Following the ruck, the Soldiers sighted their M-4s on a zero range, then walked to a pop-up range where they engage targets ranging from 50 to 300 meters with 40 5.56 mm rounds. The competitors were issued a rifle and a pistol. While carrying their weapons, the Soldiers were timed pushing two heavy ammo cans five meters while high crawling, sprinting ten meters with weapons and ammo cans, low crawling with their weapons, sprinting another 10 meters, firing six rounds from the pistol at a target, firing six rounds from the rifle at another target, then sprinting a final ten meters to the finish line. That night, the Soldiers had their Army Service Uniforms inspected and their knowledge of Army history, policies and traditions tested by a board of senior enlisted leaders. After the second long day of competition, the Guardsmen returned to their barracks for another short night of sleep. 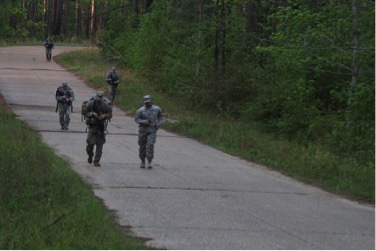 Early the next morning, the best warrior candidates began their last event, an obstacle course at Camp Beauregard. The course started with rappelling down a tower, then navigating through several obstacles including a pull-up bar and low-crawling under barbed wire and other obstructions, all while being timed. After completing this final event, the competitors and their sponsors ate lunch at the Officer’s Club where Guillory and Gilmore were announced as the overall winners, NCO and enlisted Soldier respectively. Both will advance to a regional competition, May 15-21. 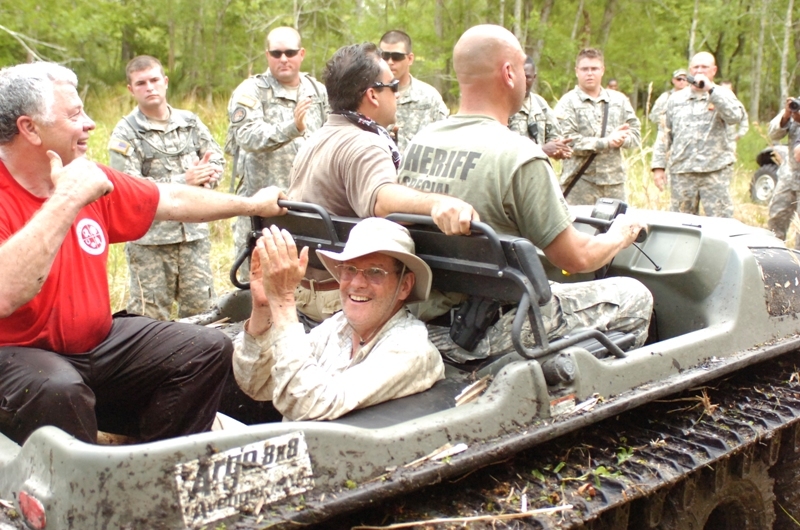 “It’s [winning] a serious point of pride for not only myself, but my unit as well – Alpha Company 3rd Battalion, 156th Infantry Regiment and the Louisiana National Guard. Even though the competition was pretty grueling, I expect next month’s competition to be even harder, and I’m taking the next five weeks to train for it,” said Gilmore.